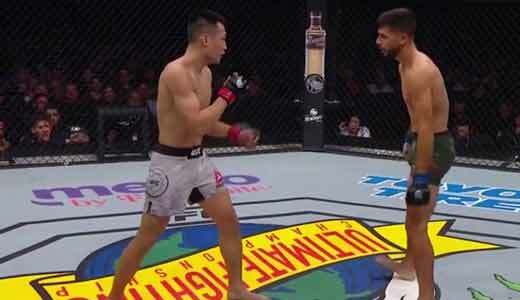 Review by AllTheBestFights.com: 2018-11-10, good fight with a spectacular finish: Chan Sung Jung vs Yair Rodriguez is one of the best mma fights of 2018 and it gets four stars (UFC Fight of the Night, UFC Performance of the Night). The black belt in hapkido, judo and tae-kwon-do Chan Sung Jung entered this fight with a professional mma record of 14-4-0 (86% finishing rate) while his opponent, the black belt in tae-kwon-do Yair Rodriguez, has an official record of 10-2-0 (50% finishing rate). 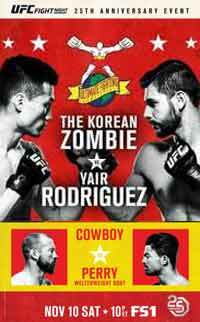 Both fighters are not ranked as they haven’t fought for more than one year: ‘The Korean Zombie’ was defeated by Jose Aldo in 2013 (Aldo vs Jung) but then he beat Dennis Bermudez in February 2017 (Dennis Bermudez vs Chan Sung Jung) while ‘Pantera’ Rodriguez fought twice last year defeating BJ Penn in January (Rodriguez vs Penn) and losing to Frankie Edgar in May (Frankie Edgar vs Yair Rodriguez).Jung vs Rodriguez is the main event of UFC Fight Night 139. Watch the video and rate this fight!